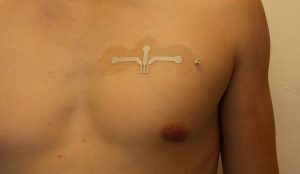 Screen Printed Bio Sensors are the flexible, cost-effective, bio-monitoring solution of the future. At Almax-RP we can print custom electrodes on flexible substrates to monitor whatever bio-parameters you need to track. We stock silver ink, silver chloride ink, carbon ink, and other specialty inks. We can print to your exact level of electrical specifications. Please call us if you would like to talk about your custom bio-sensor project. Screen Printed Flexible Circuits are low-profile, durable, vibration resistant, and abrasion resistant. 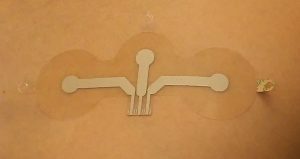 Screen printed flex circuits provide unique and cost-effective solutions for many applications. We can provide you with a flex circuit solution that fits your application. Whether you are making membrane switches, wearable electronics, or another specialty product we are ready to assist you from design, to prototyping, to production. Wearable Electronics are developed by applying screen printed silver ink onto a fabric substrate. This new technology is leading to exciting new possibilities in the medical industry and other industries. We can produce prototype wearable circuits on a fabric substrate in 1 week. Please contact us with your wearable electronic design and we will be happy to help you turn your design into a finished product. Read more about wearable electronics. Copper flex is a great solution for more complex circuits that cannot be designed with screen printed silver circuitry. Copper flex circuits are great for designs that have dense circuitry patterns or trace routing limitations. 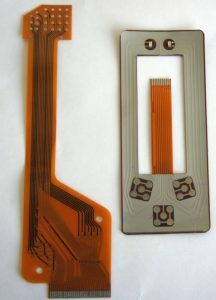 Copper flex circuits are also able to survive higher temperatures than screen printed silver circuits. Another advantage of a copper flex construction is that components can be hard soldered onto copper flex circuits for greater mechanical strength. This is because copper flex circuits can survive re-flow oven conditions. The disadvantages of copper flex design are the increased cost and lead times. Almax-RP can source copper flex from China for the lowest price for production orders. We can also source copper flex in the U.S. for iTar orders and Almax-RP is iTar registered.